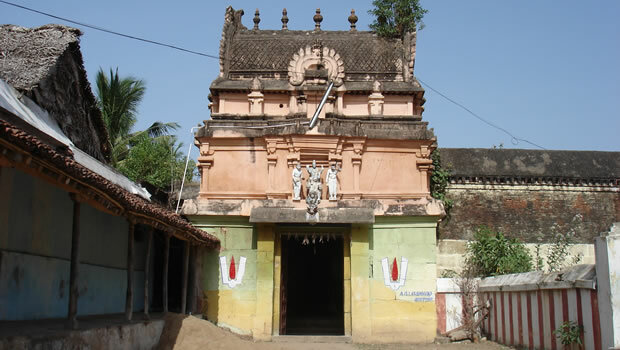 Gajendra Varadha Perumal Temple in Thirukandiyur, a village in the outskirts of Thiruvayaru in the South Indian state of Tamil Nadu, is dedicated to the Hindu god Maha Vishnu. 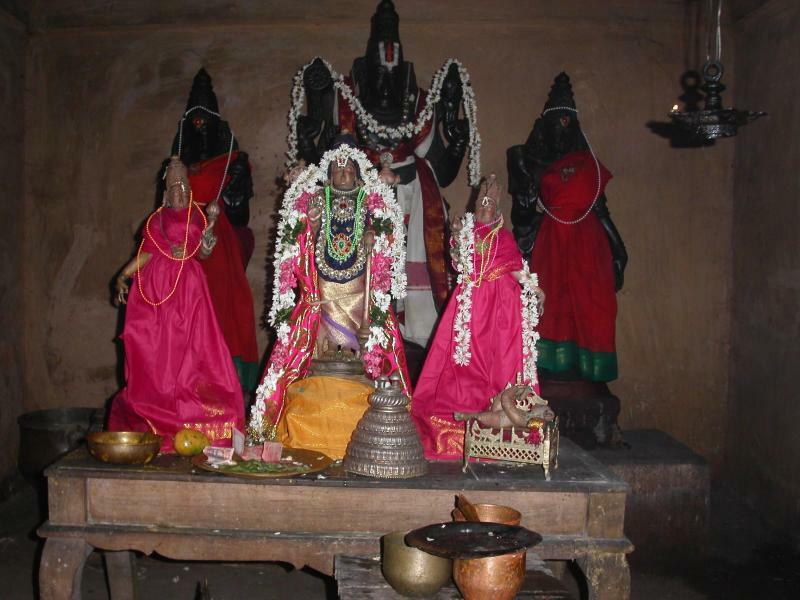 Constructed in the Dravidian style of architecture, the temple is glorified in the Divya Prabandha, the early medieval Tamil canon of the Azhwar saints from the 6th - 9th centuries AD. It is one of the 108 Divyadesam dedicated to Vishnu, who is worshipped as Gajendra Varadha and his consort Lakshmi as Ramanavalli. 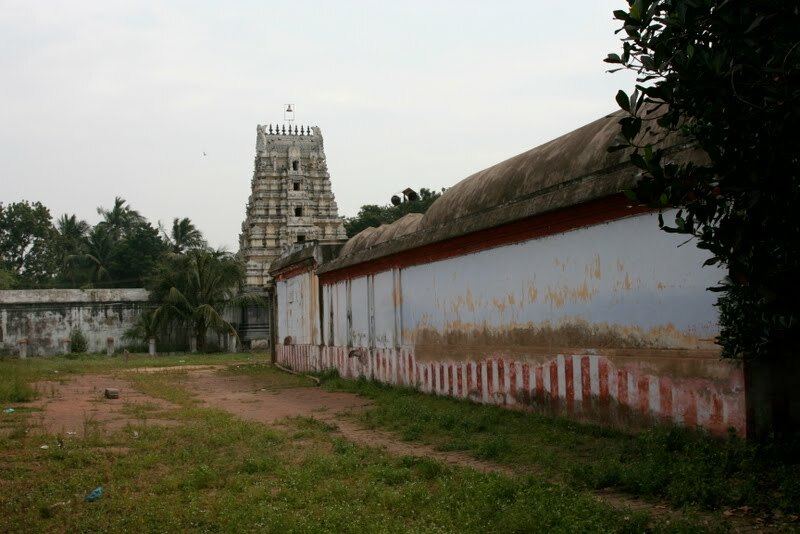 The temple is one of the five Pancha-Kannan temples, where Krishna, an avatar of Vishnu is given prominence over the presiding deity.The temple is believed to have been built by the Medieval Cholas of the late 8th century AD, with later contributions from Vijayanagar kings and Madurai Nayaks. 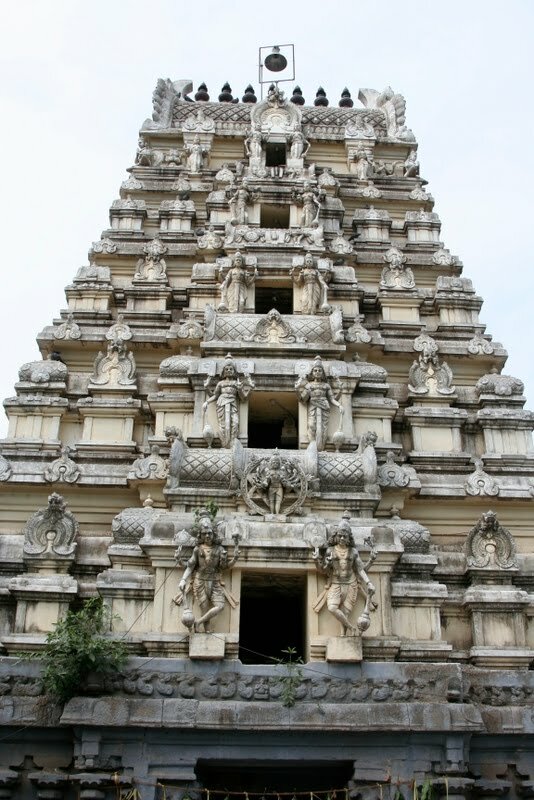 A granite wall surrounds the temple, enclosing all its shrines and its bodies of water.Gajendra Varadha is believed to have appeared to Gajendra the elephant also called Indrajumnan, the crocodile called Koohoo, Sage Parasara and Sri Anjaneya. Emperuman giving his seva (or) dharshan for Lord Anjaneya as sri Rama, gives his seva to Gajendran when his legs was caught by a crocodile, when Gajendran wants to pluck a flower in a pind and do pooja for Emperumaan. But since he was unable to get rid from his mouth, he seeked the help from Sriman Narayanan. At that time he gave his presence there and helped him out to get out of Crocodile mouth. The way he showed his seva to Gajendran alwan in one thing which is to be explained. At the final stage when Gajendran felt that it is impossible to get put his legs from the mouth of crocodile, he raised his trunk along the sky and asked for Sriman Narayanan's help. When hearing this, Sriman Narayanan flyed from Thirupparkadal on Sri Garudan.Finally he came and helped out Gajendra Alwaan. After this, Keeping the dedication of worship of Gajendran Alwaan in his mind he gave moksham, the final place each and every human thinks to go was given to Gajendra Alwaan. The basic moral of this story is that even if it is a small human (or) non - human things, when it is surrendered to God, he will help them (or) us to get out of it.Inspite of the God, giving seva for Anjaneyar as Sri Ramar and as Sri Vaikundanathan for Gajendra Alwaan, he also showed his seva as "Kannan" in the river side. Thats the reason this shetram is also called as "Krishnaranya Shetram". Once there was a Demon named Koohoo was residing near the temple tank here and he was having a habit of pulling the legs of those who came here for bathing. One day Sage Agasthiyar came and took a bath. As usual the Demon pulled his leg. The angry Sage Agasthiyar cursed the Demon to beome a Crocodile. Frightened Demon begged the sage for the relief from curse. Pleased Sage informed him that he would be relieved from the curse during Ganjendra Moksham. Kabi means Monkey, as he gave darshan to Lord Anjaneya this temple is being worshipped as Thirukavithalam familairly Kabisthalam. Six daily rituals and four yearly festivals are held at the temple, of which the Gajendra Moksha Leela, celebrated during the Tamil month of Aadi (July - August), is the most prominent. The temple rituals are performed six times a day: Ushathkalam at 7 a.m., Kalasanthi at 8:00 a.m., Uchikalam at 12:00 p.m.,Sayarakshai at 6:00 p.m., Irandamkalam at 7:00 p.m. and Ardha Jamam at 8:00 p.m.
Do maintain silence and recite your Istamantram to yourself inside the temple. Sri Kuda Maadu Koothan Perumal Temp..
Sri Kuda Maadu Koothan Perumal Temple - Thiru Arim..